Manic Mechanic is a microgame in the Sci-Fi folder in WarioWare, Inc.: Mega Microgame$! and returns as one of Dribble and Spitz's microgames in WarioWare Gold. 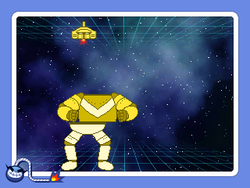 There are robot's legs at the bottom of the screen, which the player controls with the / . The other two sections of the robot (torso and head) are falling from the top of the screen. The player must move the legs to catch the other two parts. They do not need to be aligned; the bottom of one part just has to touch the top of another. 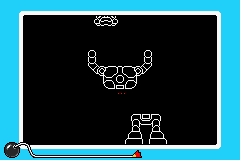 1st level difficulty: The robot resembles an anthropomorphic tiger and its parts are relatively wide. 2nd level difficulty: The robot resembles a girl and is skinnier than the robot from level one. 3rd level difficulty: The robot resembles an officer and is skinnier than the robot from level two.